In Novi Sad he started studying in music school "Isidor Bajic´”. He graduated and taken his master degree from Faculty of Music in Belgrade in class of prof. Vinko Valecic. During the studies he received numerous awards on music competitions. He also won the prizes for the best final exam and master work at the Faculty of Music in Belgrade. He is a Laureate of the Competition of Music Artists in Zagreb, 1987. As a soloist and as a member of different chamber ensembles he held concerts in country and abroad and took part in festivals like: Nomus, Bemus, Zagreb Biennale, Tribune of Yugoslav Music Art in Opatija, International Review of Composers in Belgrade, etc. Together with ensemble “Theathre Jel” from France he performed in France, Germany, Netherlands, Belgium, Luxembourg, Switzerland, ltaly, Portugal, Czech Republic, Slovakia, Hungary, Romania, Israel etc. 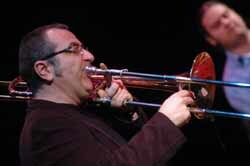 He is a member of the Opera Orchestra of Serbian National Theatre in Novi Sad (principal trombone) and Vojvodina Symphonic Orchestra (principal trombone). From 1994, he teaches trombone and chamber music at the Academy of Arts in Novi Sad and Academy of Arts in Banja Luka.